Experience 13 different types of baths including an indoor bath using water from natural hot springs pumped from 1,400m below the ground. Pamper yourself in a silk bath to soothe tired muscles for an ultimate relaxation. After soaking, stroll around in Yukata robes through the Hirokoji and Happakuyacho shopping arcades filled with food stalls and carnival games that recreate the vibrant downtown bustle of the old Edo era. Admission to Ooedo-Onsen Monogatari, a set of towels and a yukata (Japanese bathrobe) and shuttle bus service. Visitors with body art such as tattoos are not permitted to enter the premises. There is an extra charge of JPY 2,000 per person after 0200 hours. Premium attractions like the rock salt sauna, spa treatments, full body massage, skin exfoliation and carnival games may incur extra charges. The physical ticket cannot be exchanged for cash or used on more than one occasion. The lead traveller must present a valid passport for redemption. 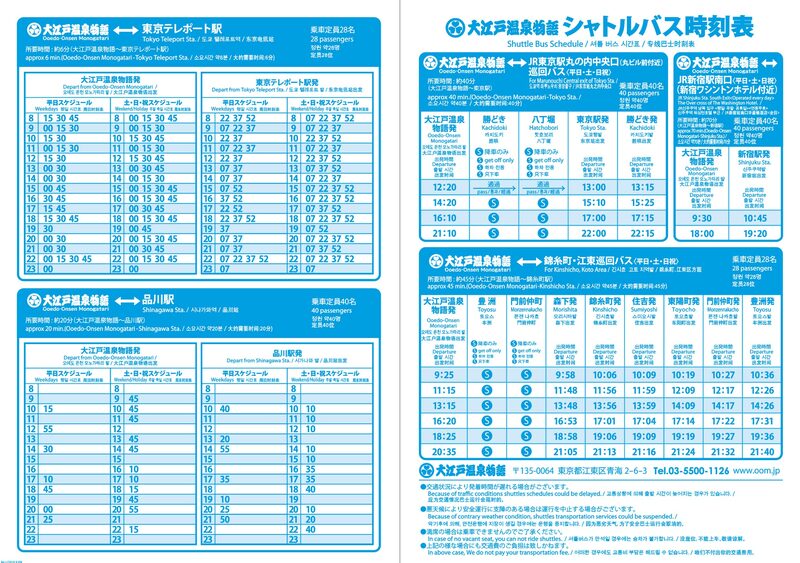 Approximately 7 minutes by shuttle bus (free of charge) from Tokyo Teleport Station on the Rinkai Line. For shuttle bus schedule,click here.